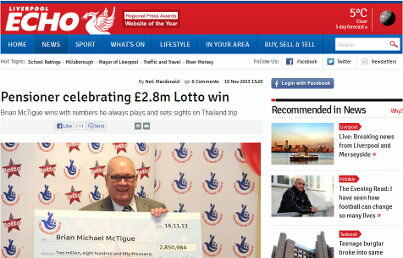 Retired Merseyside School caretaker Brian McTigue from West Derby has been playing the lottery twice a week for several years and until Saturday morning had only won a measly £78. In the Saturday draw his luck turned for the better as the results he obtained Sunday would prove. He put the TV on, checked his first ticket and was thrilled to discover he had a three-number match worth £25. He still had a couple more tickets to check but was interrupted by a builder who gave him a quotation for house repairs, and he decided to prepare dinner in the meantime. When he got around to checking the other tickets, he found he had won a £2.8 million jackpot and was literally moved to tears. He asked a friend to verify and then called the lottery offices. He now plans to visit the pub to celebrate, go on a trip to Thailand, and pay for the house extension.